Occasion: Emergency meeting of the Association of Rich Guys© (Indian Division) to discuss really important things. “Me: Ladies, Gentlemen and Hutchinson.D.Pug. We are gathered here today in light of the serious situation that has occurred after the bomb blasts in Bangalore and Ahmadabad. Many of us have received death threats. I am personally offended that I have not received a death threat but my good friend Muk-hays Ambani has. 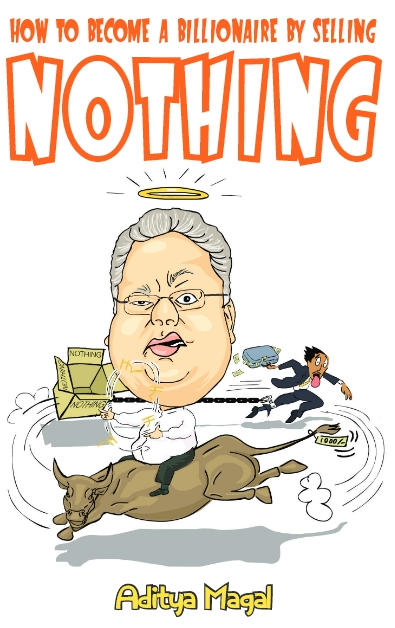 Most importantly, the Bombay Stock Exchange is also a target. You people must make this a priority as well because all your money is here and none of you are as smart as me when it comes to making money of the Sensex. 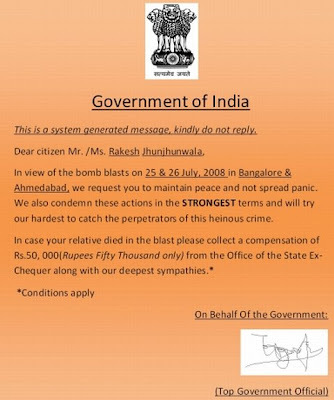 Moreover after receiving this from the Government, I trust them even less. Me: I now open the floor to debate possible solutions to this problem of bombs, terrorists and terrorists who want to bomb the BSE. Pravin Togadia: We can combat this problem by conducting riots. Ha-Nil Ambani: How will that help? Muk-hays Ambani.I call for my little brother’s comment to be cancelled from the records. I use my first right of refusal to refuse him the first response to Togadia’s solution. Togadia: Shut up Ambanis & listen to me. Riots work because I’ve been taught that Riots are the one universal solution to all of mankind’s problems. For example the solution to the problem 2+2 is not 4 but riots. Inflation can be solved by riots. Power Cuts can be solved by riots. Poverty and hunger can also be solved by riots. The Kashmir problem can be solved by using riots. Even riots can be solved by riots. Alyque Padamsee: Can I go now? There is a TV channel somewhere that needs my expert opinion on the bomb blasts. 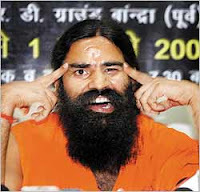 Baba Ramdev: Riots are not the universal solution to mankind’s problems. YOGA is. Let us have a mass workshop on Yoga and teach Yoga to everyone. I plan on releasing a new book ‘Yoga For Terrorists’ which will dissuade them from bombing anything. Togadia: Eh Baba, How dare you say YOGA>RIOT; just for that I will conduct more Riots. Baba Ramdev: No problem, you can use my book ‘Yoga For Rioters: A Comprehensive Guide To Better Rioting’ available for Rs.799/- only. In fact if you buy it today you get a free DVD of Shilpa Shetty doing Yoga on a boat. RatanTata: I once saw a terrorist family of five using just one gun. I was moved. I now plan to open a manufacturing unit in Singur to make cheaper guns for terrorists. I shall call it the MEGA AK 47-NANO.It will cost only one hundred rupees. Mamata Banerjee: Not against the blasts baldy, against Ratan Tata and the new Singur plant. Narayan Murthy: At Infosys we are driven by a drive to create low cost solutions for the world. Maybe we can have some of these terrorists outsource their work to us. We will conduct bombings for them at cheaper rates. Unfortunately those guys want to bomb our own campuses in India. Sachin Tendulkar: Visa Power for bombings, go get it. Pavan Munjal: It’s a difficult decision for me. Ever since the bombings started the sales of Hero Cycles have increased.